If you’ve embarked on the sonic adventure of guitars and you’re trying to get as much information as possible not only on how to play this instrument but also on how to keep it in a great condition, you’ve come to the right place. As a beginner, there still might be lots of things you need to learn more about. From a quality guitar tuner to help you enjoy a pleasant sonic output to guitar amps for your street gigs or practice sessions, there are many accessories you will need in order to get the best out of your guitar. A humidifier is part of them. And this item is not optional. It is actually a must if you want to prolong your instrument’s lifespan. Many guitars available on today’s market are crafted in a controlled environment, which means that the parts they are made of are exposed to a constant humidity level from the beginning to the ending of the building process. Keeping humidity at the same level is of paramount importance since the wood can dry or swell if changes occur as far as humidity is concerned. Once guitars leave the factory and reach the stores and, later, the owners, the humidity they are exposed to should not be overlooked. Most guitar shops make sure to store the instruments in the right environment and protect them from harmful elements. However, more often than not, many owners tend to ignore that aspect once they’ve acquired the guitar they wanted. Leaving the instrument in extremely damp or dry environments, though, can lead to damages that will make it impossible to use the guitar again and produce decent sounds. Storing acoustic guitars in inappropriate conditions can make them crack, dry out, or swell, and thus can lead to fret buzzing. Even keeping your guitar in a room that is heated during the winter can damage your instrument. Here is where a humidifier comes into sight. These items were developed to regulate humidity and thus prevent such damages from occurring whether you store your guitar in a case or you hang it on a wall. Therefore, if you want to take care of your investment, it is worth getting a quality humidifier as it will help you enjoy your guitar for longer. Today’s market overflows with all sorts of humidifiers, which is great and intimidating at the same time. While the great variety of them will help you find a product to best suit your needs and budget, the many different items might also require lots of time and browsing before you identify the humidifier you need. To help you narrow down that exhausting list, you should decide on the type of humidifier you want. The most popular ones include soundhole humidifiers, guitar case humidifiers, and room humidifiers. Soundhole humidifiers are easy to use and affordable. Such items sit around or in the instrument’s soundhole. They either cover the soundhole entirely or sit in between the strings. They can be used only if the guitar is stored in a case, though. You will also find case humidifiers that, as their name suggests it, will be placed in the guitar case. Such products come in different forms, the most common ones including a plastic or a material tube that will enable water vapors to pass through. Just like soundhole humidifiers, they will work if you keep the instrument stored in the case. If you prefer to keep the instrument on a stand or hang it on a wall, then you might want to try a room humidifier as such a product will make sure the entire room is regulated. What is great about a room humidifier is that it may help you enjoy a healthy humidity level for you, too. The only drawback is that such devices fall into the expensive category. Using a humidifier is not enough to make sure your instrument is stored or used in the right environment. There are other things you should consider to provide the instrument with the humidity and temperature needed to prevent damages from occurring. One of them is related to the number of guitars you use. While many players prefer a room humidifier, it is best to go for individual humidifiers if you have several guitars because this way dampness will be adjusted based on how a guitar responds, a benefit you cannot enjoy with a room humidifier. If you are a guitar collector and have only wooden pieces, a room humidifier might do as long as it keeps the humidity level at 30-45%. Humidifiers should never be left in direct contact with the instrument. 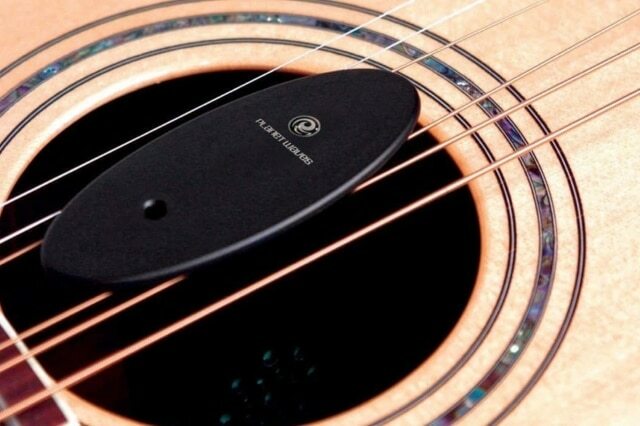 If you go for a soundhole humidifier, make sure you suspend it from the strings, or if you choose a case humidifier, don’t let it touch the wood. 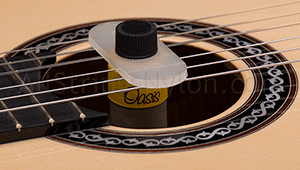 Many guitar experts and players recommend the use of both a soundhole humidifier and a room humidifier. This way, the humidity level will be the right one when you take the guitar out of the case and expose it to your room humidity. When you play the guitar, try to do so away from windows, air conditioners, and heaters. It is best to avoid exposing the instrument to direct sunlight for extended amounts of time. Extreme temperature differences can also have a negative impact on your guitar. Avoid moving the instrument from a hot environment to a cold one as such habits can make the finish crack. In case you have stored your guitar in inappropriate conditions for a longer period of time, you might want to have a professional see it for a proper damage assessment as well as a new setup.